Endemic to Vanuatu where, although it is not directly threatened, the population is small with perhaps less than 1000 mature individuals. This species has previously been misidentified as Agathis macrophylla, which occurs on the three southernmost islands of Vanuatu, not on Espiritu Santo. Endemic in Vanuatu on the west coast of Espiritu Santo (Cumberland Peninsula and Mt. Tabwémasana ('Santo Peak')) It has an estimated extent of occurrence (EOO) of about 104km² and an area of occupancy (AOO) estimated to be about 12km². It occurs at altitudes between 450 and 760m above sea-level. 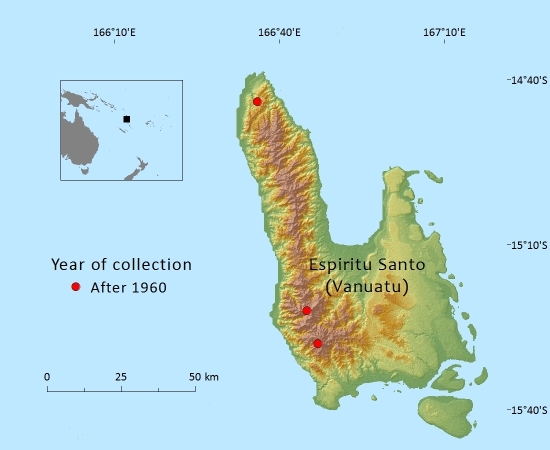 The occurrence of large trees of Agathis in the interior mountains of the island of Espiritu Santo in Vanuatu has long been known, both to native islanders and at least since 1963 to visitors. In April 1987 G. Bourdy collected numerous herbarium specimens from 'Santo Peak' (Mt. Tabwémasana), where the trees were observed to be abundant, with several very large individuals seen. This was thought to be the only station of the species, but an earlier collection (specimen at K) dating from February 1979 was made at the nothern end of the mountain range on the Cumberland Peninsula on the "top western slopes" (ca. 600m above sea-level.) and so there are at least two sub-populations of this species. Agathis silbae occurs as an emergent large tree in tropical lower montane rainforest on the wetter, western and northwestern slopes of the central mountain range. It has been recorded to occur with Calophyllum neo-ebudicum, Cryptocaya turbinata, Dysoxylum sp., Myristica fatua, Podocarpus sp. and Syzygium spp. (Baldwin et al., 1993; Siwatibau et al., 1998). This species appears to be planted in or near villages on the west coast of the island. There is no evidence of logging of trees in the interior mountains and this is unlikely to happen as the trees, although large, have short boles making them less desirable for timber. Traditionally, the resin has been used for lighting and to caulk canoes, and its soot for tattoos; the bark for medicines; and the root tips for "fattening babies" (Siwatibau et al., 1998; Wheatley, 1992). Some trees are cultivated in coastal villages. Santo kauri was commercially logged by a local operator between 1995 and 1997, and the wood is much in demand. Logging is the principal threat to the species, and Corrigan et al. (2009), who work with the Vanuatu Department of Forests, present detailed recommendations for its management. There are no protected areas established in the mountains of Espiritu Santo. Baldwin, P., Hidson, J., Siebur, J. & Pedro, F. (1993). Forest resources of Vanuatu. A summary of the forest resources of Vanuatu derived from the National Forest Inventory. Brisbane, Queensland Department of Primary Industries: 196pp. Beveridge, A.E. (1975). Kauri forests in the New Hebrides. Philosophical Transactions of the Royal Society of London (B.) 272: 369-383. Corrigan, H., S. Naupa, R. Likiafu, J. Tungon, C. Sam, L. Kalamor, L. Viji, L. Mele, and L. Thomson. ( 2009). A strategy for investigating, conserving, and managing the genetic resources of Santo kauri (Agathis silbae). Pp. 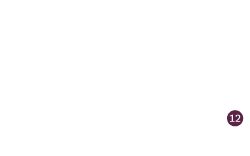 383-390 In: Bieleski, R.L. & Wilcox, M.D. (eds. ), Araucariaceae: Proceedings of the 2002 Araucariaceae Symposium, Araucaria-Agathis-Wollemia. Dunedin, New Zealand: International Dendrology Society. de Laubenfels, D.J. and Silba, J. (1987). 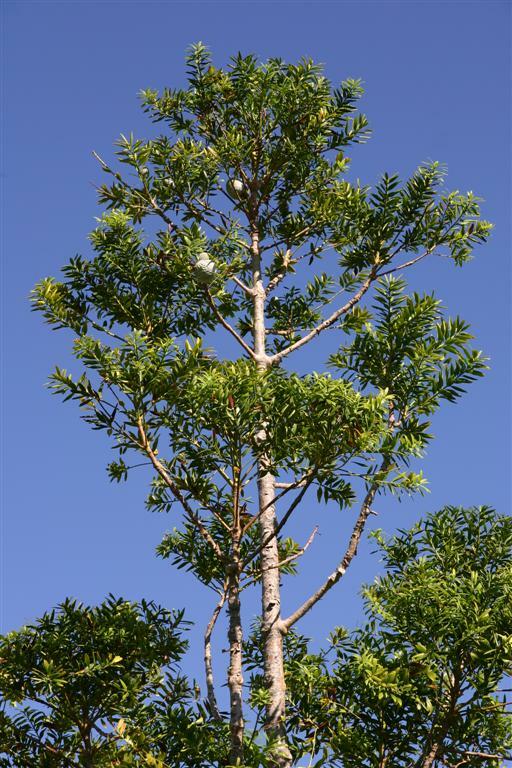 The Agathis of Espiritu Santo (Araucariaceae), New Hebrides. Phytologia 61: 448-452. Siwatibau S, Bani C, & Kaloptap J. (1998). SPRIG Rapid Rural Appraisal Survey of selected tree species in Vanuatu. Report by Island Consulting to CSIRO Division of Forestry/SPRIG Project. Thomas, P. (2013). Agathis silbae. In: IUCN 2013. IUCN Red List of Threatened Species. Version 2013.1. <www.iucnredlist.org>. Downloaded on 05 July 2013. Thomson, L.A.J. (2006). Agathis macrophylla (Pacific kauri). Species Profiles for Pacific Island Agroforestry. Available at: Http://www.Traditionaltree.Org/ 6 August 2007. (Accessed: 27 July 2010). A.Farjon,and M.F.Gardner, 2016. Agathis silbae, from the website, Threatened Conifers of The World (http://threatenedconifers.rbge.org.uk/taxa/details/814).